Virtually every modern web application and databases play a crucial role. Due to the dynamic nature of current web development, even rudimentary applications require some mechanism of storing, retrieving and modifying data (that’s why at Hostinger we offer unlimited MySQL databases for our premium and business clients). Naturally, as the importance of databases has soared, so has the popularity of certain Relational Database Management Systems (RDBMS). Two of such systems are MySQL and SQL Server. Both perform the same functionality, though they have distinctive use-cases. They run different flavors but are jointly based on, SQL, or Structured Query Language. As such, developers can expect a few similarities between MySQL and SQL Server, such as the use of tables to store data, reference to primary and foreign keys, as well as multiple databases within a single environment or server. It wouldn’t be inaccurate to call MySQL and SQL Server the two most popular RDBMS solutions in existence, though Oracle and Postgres might have something to say about it. Even though we’re gradually witnessing a shift from SQL towards NoSQL, the former remains the more dominant presence. it means that now is as good a time as any to learn either MySQL or SQL Server. 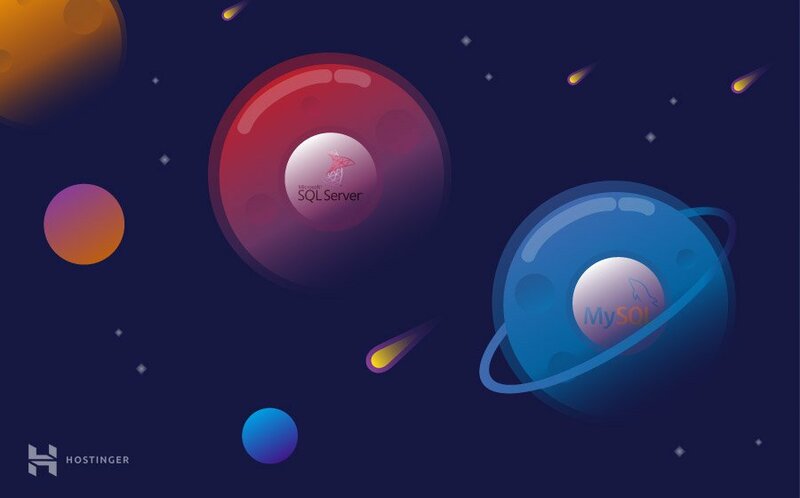 In this guide, we will briefly explain what MySQL and SQL Server are. We will find out the difference between MySQL and SQL Server, and help you choose which is the best for your needs. Developed in the mid-90s (later acquired by Oracle), MySQL was one of the first open-source databases and remains so to this day. This means that there are several alternatives of MySQL. But the differences between these variants are not too pronounced; syntax and basic functionality remain identical. 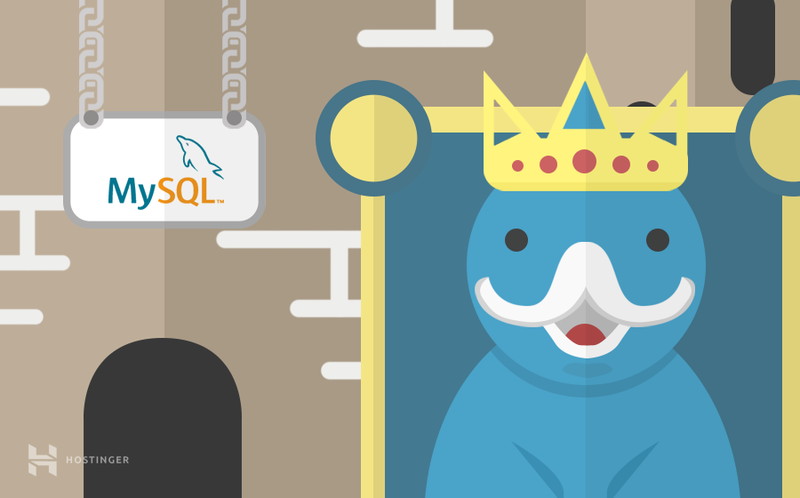 Something which has become a characteristic of MySQL is its popularity within the startup community. Because it’s open-source and free, developers can easily get started with MySQL, and modify its code in the rare instance they might need to. MySQL is typically used in conjunction with PHP and Apache Web Server, on top of a Linux distribution, which has led to the famous acronym LAMP (Linux, Apache, MySQL, PHP). The SQL Server, also known as Microsoft SQL Server, has been around far longer than MySQL. Microsoft developed SQL Server in the 80s, with the promise of providing a reliable and scalable RDBMS. These remain the core qualities of SQL Server after all these years, as it is the go-to platform for large-scale enterprise software. SQL Server is mainly intended for developers who are using .NET as their development language, as opposed to PHP for MySQL. This makes sense, since both fall under Microsoft’s umbrella. As alluded to earlier, SQL Server works best with .NET, while MySQL can be paired with just about every other language, most typically with PHP. It should also be mentioned that SQL Server used to run exclusively on Windows, but this has changed since last year when Microsoft announced Linux support for SQL Server. Still, the Linux version is hardly mature enough, which means our recommendation remains for you to keep working on Windows if using SQL Server, and switch to Linux if going with MySQL. Both chunks of code achieve the same result – returning 3 entries with the youngest age from a table named person. But there is a drastic change in syntax. Of course, syntax is subjective, so we can’t give any recommendations; go with whichever seems more intuitive for you. The full list of implementational changes between MySQL and SQL Server can be found here. A major advantage of proprietary software vs open-source software is the exclusive support it receives. In this particular case, the advantage becomes even more profound, as SQL Server is backed by one of the largest tech companies around the globe. Microsoft has built additional tools for SQL Server, that come bundled with the RDBMS, including data analysis tools. It also features a reporting server – SQL Server Reporting Services, as well as an ETL tool. This makes SQL Server the swiss-army knife of RDBMSs. You can get similar features on MySQL as well, but you have to scourge the web for third-party solutions – not ideal for most people. Another big difference that is sometimes overlooked between MySQL and SQL Server is the way they store data. SQL Server uses a single storage engine developed by Microsoft, in contrast to multiple engines on offer for MySQL. This gives MySQL developers much more flexibility, as they can use different engines for different tables, based on speed, reliability or some other dimension. A popular MySQL storage engine is InnoDB, which falls on the slower end of the spectrum, but maintains reliability. Another one is MyISAM. Not many people know this, but a potentially deal-breaking difference between MySQL and SQL Server is that MySQL doesn’t allow you to cancel a query mid-execution. This means that once a command starts executing, you better hope that any damage it might do is reversible. SQL Server, on the other hand, allows you to cancel query execution mid-way in the process. This difference can be particularly damning for database admins, as opposed to web developers, who execute scripted commands that rarely require query cancellation during execution. On the surface, there isn’t much to look at when comparing security differences between MySQL and SQL Server. Both are EC2 compliant, which means that you are mostly in safe hands choosing either of the two. Having said that, Microsoft’s shadow also looms large here, as it has equipped SQL Server with proprietary, state-of-the-art security features. A dedicated security tool – Microsoft Baseline Security Analyzer – ensures robust security for the SQL Server. So, if security is a major priority for you, your choice has just been made for you. This is where the SQL Server becomes much less attractive, and MySQL earns major points. Microsoft requires you to buy licenses to run multiple databases on SQL Server – there is a free version, but it’s only meant to familiarize you with the RDBMS. In contrast, MySQL uses the GNU General Public License, which makes it completely free to use. Do note, however, that if you need support or assistance for MySQL, you will need to pay for it. Which brings us to our next point. While you can pay for MySQL support, the scenario rarely arises, due to stellar community contribution and support for it. A perk of having the wider community on your side is that most people do not have to reach out for official assistance – they can search the web and find a ton of solutions. It is important to note that both RDMBSs support different Integrated Development Environment (IDE) tools. These tools offer a cohesive environment for development, and you should pay close attention to which one best suits your needs. MySQL boasts Oracle’s Enterprise Manager, while SQL Server uses Management Studio (SSMS). Both have their pros and cons and might tip the balance if you have nothing else left to base your decision on. The choice of RDMBS is an important one for those just starting modern app development. People who chose one system rarely switch later, which means that it is crucial to weigh different offerings and go with the best for you. In this guide, we have discussed two of the most widely used RDMBSs – MySQL and Microsoft SQL Server. We looked at several key differences between MySQL and SQL Server, even one of which could be enough to swing your decision in favor of one over the other. Ultimately, the choice is yours. As a rule of thumb, if you’re developing medium/small-sized applications and predominantly use PHP, go with MySQL. Whereas, if you’re interested in building large-scale, secure, resilient enterprise applications, SQL Server should be right up your alley. It is still early beta. And many features must be added yet, but for simple C# applications, it may be good enough.